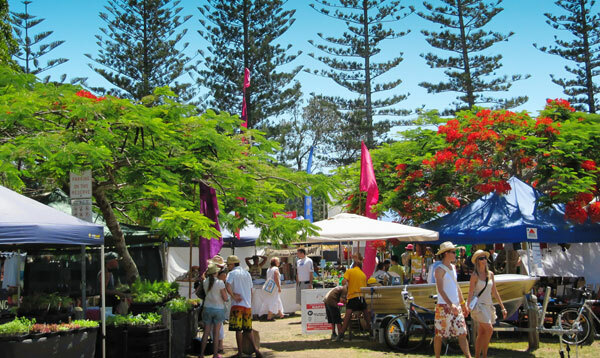 Brunswick Heads Markets - First Saturday of every month. Brunswick Heads is a charming beachside town located 15 minutes north of Byron Bay. The whole town has a classic family holiday feel, as it is a great spot for fishing, picnics, swimming in the river, and eating fish and chips. The pristine Brunswick River makes for an incredibly scenic backdrop to the many cafes, restaurants, playgrounds, and shops, and, of course, to the markets. From about 7am on the 1st Saturday of every month, the Brunswick markets, located in Memorial Park, come alive with the many artisan stalls, which provide clothing, plants, food, candles, soaps, coffee, and more. The products found at the Brunswick Heads Markets are a mix of locally made and imported goods. The delicious hot food is not to be missed. You can also pick up a few fresh groceries. Parking is available free of charge throughout the town, which is at easy walking distance from the markets. After exploring the various market stalls, Brunswick town and beach offer activities for the remainder of the day. The town offers unique shops, and eclectic cafes that give Brunswick Heads a character of it own. Across the river, over the footbridge, is Brunswick beach and Torikina beach. There are also two playgrounds and grassy areas, which are great places to enjoy an ice cream. The Brunswick Heads markets are a perfect excuse to spend the day exploring the town and the picturesque river and beaches. For any further information about the Brunswick Heads Markets please call or email us so we can answer any further questions you may have. Bookings open at the 3rd November, 2018 market. Stall costs: $35 (single) | $70 (double). No electricity will be provided. Stallholders will need to bring their own battery or solar source. Battery and solar goods are available at Bunnings or BCF. No leads, power boxes or lights will be available to borrow. Stallholders must have their own public liability insurance. Some parking may be available in Memorial Park. Full instructions will be provided at time of booking. 150 stalls for late Christmas shopping – candles, soaps, artwork, clothing, jewellery, manufactured goods, toys, music, plants but no food stalls from 3pm to 10pm. Santa will be in attendance from 6-7pm. Fireworks will commence at 9pm. McGregor’s Family Amusements – carnival with dodgems, laughing clowns, big slippery slide, scrambler, rides for the very young and the usual Dagwood Dog or Fairy Floss. The Housie tent will be in operation with proceeds going to local community groups.